Computers use energy to surf the internet, and that electricity usually comes from dirty fossil fuels at release harmful carbon emissions into the atmosphere. What if you could combat these emissions by supporting clean renewable energy? You Can! 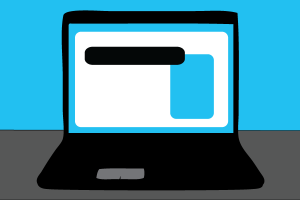 With renewable energy credits, you can offset the CO2 emissions associated with the energy consumed by people’s computers while they are on your site. Based on web traffic, you can estimate how much CO2 is generated by visitors to your site and offset that amount with credits of a matching amount of electricity from renewable energy sources. After purchasing a website offset, you will receive a carbon offset web badge to proudly display on your site (like the one to the right). This will let your visitors know that you have taken care of their carbon footprint while they visit your site. 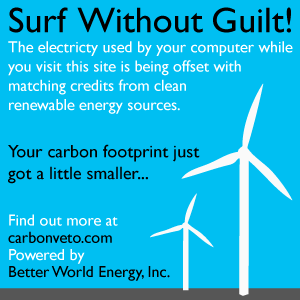 If you represent a high traffic website interested in carbon offsetting, please contact Better World Energy for a custom carbon offset solution. Conservation is ideal, but you can't tell people to stop visiting your website. Offset the annual energy consumption of approximately 750 daily visits to your site, countering 1,341 lbs. of CO2 emissions associated with the electricity generated to power all the computers visiting your corner of the web. Offset My Website For A Year! So your website is "kind of a big deal." Great! By offsetting 13,400 lbs. of CO2 per year you can counter the emissions of 7,500 daily visits. That should keep them coming back. To tailor an offset for a larger site, please contact us. Offset My Internet Sensation For A Year! How is the energy use calculated? Each computer uses a different amount of electricity. A laptop uses about 50 watts of electricity per hour while a desktop and monitor use around 270 watts. An average of 100 watts per hour has been assumed. Each computer visits a website for a different length of time, but an average time of two minutes and fifteen seconds per visit has been assumed. A blog or small business website with 750 visits per day represents 28 hours and seven minutes of combined computer use time. For the average computer, this requires 2,812.5 watts of electricity per day. In one year, visits to the site generate 1,376.62 lbs of CO2. An “internet sensation” website is assumed to have an average of 3,650 visits per day represents 136 hours and 53 minutes of combined computer use time. For the average computer, this requires 13,687.5 watts of electricity per day. In one year, visits to the site generate 6,699.55 lbs of CO2, which requires 4,995.93 kWh of renewable energy to be placed on the grid. How is the electricity offset? The vast majority of America’s electricity is still generated from fossil fuels. These generators are the #1 producers of harmful CO2 emissions. The best way to reduce CO2 emissions is to go straight to the source and replace traditional energy regeneration with clean renewable energy. In the Northeast Power Coordinating Council region of the United States, 1,341 lbs. of CO2 are offset by 1,000 kW hours of electricity from renewable energy sources. By purchasing renewable energy credits, you support adding clean renewable energy to the electricity pool and reducing global reliance on fossil fuels.